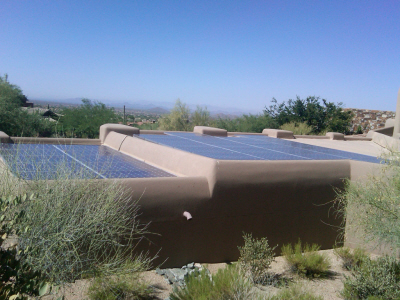 At One Way Electric in Phoenix, AZ, we do not build “cookie-cutter” solar power systems. Our products were built with your needs and expectations in mind. Our solar expert will explain the benefits of using solar power on a case-by-case basis so that our clients can make informed decisions. We are passionate about solar power. Our business of designing and installing quality solar power systems is a way for us to attain our goal of creating self-awareness for a more sustainable future. Besides, with the electricity rates steadily rising, it’s time for us to save money whenever we can. As an alternative to nuclear and fossil fuels, solar electric power is cleaner, more reliable, longer lasting, and safer for the environment. To get solar electric power, two kinds of modules have to be placed: photovoltaics and solar modules. Photovoltaics (PV) use between 15%-20% of the sun’s energy and are sensitive to shading factors, so it is important to have no shade in the area in which the modules will be placed. 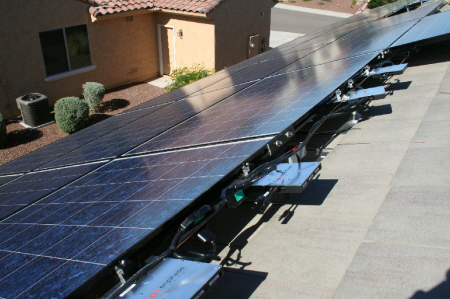 Solar modules can be roof mounted or ground mounted, depending on site specifics. However, solar modules create DC power so an inverter is needed before you can use the electricity. One Way Electric believes that the conservation of energy is just as important as creating energy. For that reason, we will always look for inexpensive ways to lower your electric bills before sizing a system. One simple way to converse can be through switching from standard incandescent light bulbs to compact fluorescents (CFLs) or LED lights. We will also check the age and efficiency of major appliances, such as your refrigerator, dryer, washer, water heater, AC unit, and others. Another way is by having your house “buttoned up” by changing single-paned windows to double-paned ones and ensuring that your walls and roofs are properly insulated. In addition to conserving energy, this can also affect the air quality in your home. You can also include overhangs on windows that have Southern exposure or even plant trees for natural shade. If you invest in energy conservation, you’ll see that you won’t have to create as much. In this case, getting solar energy will definitely make more sense financially. What is STC, and how does this affect my rebate and cost? ANSWER: STC stands for Standard Test Condition. The manufacturers of solar modules test the modules at 77°F with artificial sunlight perpendicular to the module. This is how they determine the “sticker wattage,” or what the module says it can produce. For example, the “sticker wattage” of a Sharp ND-216U1F module is 216 watts. That means this solar module will produce 216W when it is 77°F and the sun is perpendicular to the module. Rebate amounts are based on the STC DC rating of the system. What is a solar photovoltaic (PV) system? ANSWER: A photovoltaic (solar electric) system converts the sun’s light energy into electricity by producing direct current (DC) in the PV panels. The DC current is sent to an inverter that converts the DC current to alternating current (AC) for general use in your house or business. 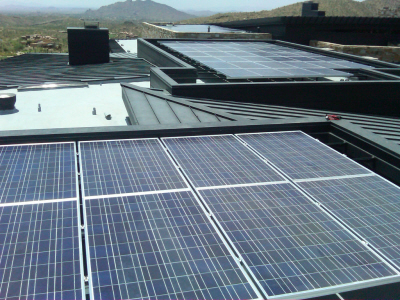 What is a grid-tied solar PV system? ANSWER: A grid-tied solar PV system “stores” any excess power produced by your PV system and supplements power when your demand for electricity is greater than your on-site solar production. Grid-tied solar PV systems avoid the need for costly, toxic, and high-maintenance battery storage systems. This system’s output is directly linked to the distribution lines that normally provide you with electricity. Will a grid-tied solar system work during power outages? ANSWER: A grid-tied solar PV system will automatically shut down during power outages due to safety regulations. If continued power is essential, you can invest in an uninterruptible power supply (UPS) or generator. Though grid-tied systems with battery backup are available, they come at a cost; the installation fees are higher, there is more maintenance required, and the toxicity levels are higher. It also decreases the performance efficiency of your solar system. Some new inverters will allow the use of a single emergency outlet as long as the sun is shining. 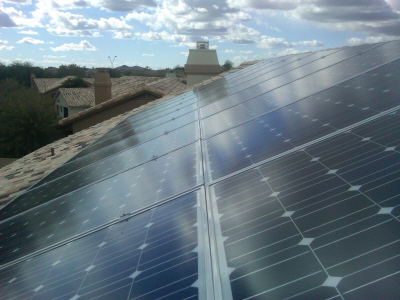 What is two-way (or net) metering? ​ANSWER: In a grid-tied solar PV system, electricity can flow through your meter in either direction, depending on the amount of electricity your system has produced and how much you are using. When your solar PV system is producing more than you need, the surplus is pushed back into the grid, spinning your meter backward. At other times, you may need to draw supplemental power from the utility grid, making your meter spin forwards. Net metering keeps track of the difference between the grid-supplied electricity you use and the surplus generated by your solar PV system. Will the utility company pay me for the excess electricity I generate? ANSWER: APS or SRP will credit future bills for excess electricity created and will pay the customer at the end of the year for remaining credits at the wholesale rate at that time. What is Time-of-Use (TOU) metering? ANSWER: A TOU rate plan from APS bases the price you pay for electricity at the time of day and the time of year you use energy. With TOU, you typically pay more for electricity during peak hours (9 AM to 9 PM during weekdays or noon to 7 PM in the summer). You pay less during all other hours (off-peak, partial-peak) and in the winter. TOU can be very beneficial to solar PV owners since, under the net metering laws, the power company must credit you at retail rates for any excess power you produce. So, if you can “sell” your excess electricity at peak rates and buy it back at off-peak rates, your PV system will have a greater impact on lowering your energy costs.